"Just a note – thank you for the good service and quality of the signs – they are all up!" 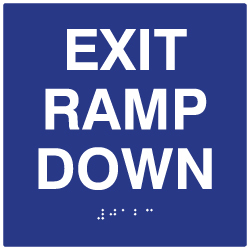 These made-in-America ADA Compliant Exit Ramp Down Signs are high-quality and professionally manufactured. Our ADA Compliant Signs meet ADA sign regulations and will pass official ADA building inspections.